We had a fresh layer of barkdust blown in yesterday. We do it every two or three years, and getting it blown in (rather than spreading it yourself) is far and away a better way to go. I always forget what kind of barkdust we get, or who we use, though, so it’s always a pain to get it scheduled for the next time. This time, I’ll blog it - so I can find it again later! We used Grimm’s Advanced Bark Blowing. We’ve had ProGrass do it before, too, but they’re slightly more expensive. Grimm’s does a really good job at a decent price. Done and done. Now that I’ve solved my media center problem, let me do a review of what I was trying to do, what I did, and some of the lessons learned along the way. Access to my DVD collection. I have a lot of DVDs and, yes, I do like to re-watch them. The problem I’m running into is the same problem I ran into with my music collection - inconvenient access. I think about a movie I want to watch, then I have to go through the collection, find it, fire up the system… it’s a lot less “at my fingertips” than I’d like. It’s also nearly impossible to browse, so if I want to look for something to watch, I have to either riffle through the binders of discs, use an outdated printout list of movies, or fire up DVD Profiler and scan through there. Backup solution. My dad and I both have had DVDs go bad. Ideally I’d like to be able to re-burn a disc if I have the original go bad. UPDATE: I’ve changed my position on this since the original setup and I’m only storing the movie files now. Full quality, all features. I want to be able to navigate and view the DVD as if I had put it into a DVD player - full menus, no reduced quality, all audio tracks, all extra features. UPDATE: I’ve changed my position on this since the original setup and I’m only storing the movie files now. Wife acceptance factor. I want it to be easy and accessible to Jenn so she can use it, too, without having to memorize the 37-button-sequence to get it working. Network storage. I want everything to be stored centrally so the data can be accessed by any device. Simple, simple, simple. As few “moving pieces” as possible. I know there are ways to get very fancy setups going if you want to invest the time and effort in tweaking, perfecting, and messing about with the system. I’m not a hobbyist, and investing that level of time doesn’t interest me. I want to set it up and have it “just work” in as much an appliance fashion as possible. Expandable. If I need to add storage, add another media front-end, etc., I want the flexibility to do that. Good form factor. I don’t want something ridiculously ostentatious sitting in the living room. I want it to look good. Music and picture access. DVDs are my primary goal, but if I can get access to my music and pictures through the system, so much the better. Windows Home Server. For music, home movies, photos, and documents I went with a Windows Home Server as the central storage mechanism. It gave me some great first impressions and I learned a lot even two weeks in, but I’ve never looked back. WHS got a bad rap early on with some data corruption defects that have been fixed and I think people really need to give it a chance. It has a great form factor, is totally expandable, and has all of the DLNA sharing pre-configured for easy access to music, pictures, and videos for compatible devices. It plugs in and “just works,” appliance-style, and even provides additional features like monitoring your network health and backing up your PCs. Dollar for dollar, I’d take this over a generic NAS any day. (That said, there are some recommended upgrades you might want to do to make the most of your server.) UPDATE: I originally used Windows Home Server as the single storage solution, but ended up adding the Synology NAS and switching the DVD images to that. Synology NAS. I went with the Synology DS1010+ for movie storage. I did this because I ran into some odd disk-related issues with the home server (bad drives) and since I didn’t have enough disk space to turn on duplication for my DVD images, I wanted to figure out some sort of fault tolerance if a drive went out. The DS1010+ will let me run RAID 5 and is super fast, so I moved to that for the DVDs. Front-End Software - Windows 7 Media Center and XBMC. I looked at MediaPortal, TVersity, Front Row, Xbox Media Center, just using the Xbox 360 as a media extender, and several other front-end software packages, but Windows Media Center initially won out for several reasons. First, it comes bundled with the OS - fewer moving pieces (unlike an additional application you’d have to install, e.g., TVersity). Second, it’s handled VIDEO_TS DVD rips for quite some time (unlike Front Row, which only just recently got it and has no real documentation out there available for it). Third, it handles almost all of the other formats I use for pictures, music, etc. (unlike Xbox 360 as a media extender, which doesn’t support full DVD rips). UPDATE 12/14/09: I updated to Windows 7 from Windows Vista and it made a lot of difference in performance - smoother playback, faster loading of the DVD Library, etc. UPDATE 12/29/11: I have just started using XBMC as the front end instead of Windows Media Center because the rendering of the DVD library is much faster than Windows Media Center, especially with a lot of movies. It also has a much nicer UI with art and info than the more sparse WMC UI. Video Format - VIDEO_TS. I blogged about the pros and cons of various video formats, and in the end I picked VIDEO_TS as the format I’d rip my DVDs into since it was most compatible with the various software packages and didn’t require any additional tweaking in Media Center to use. Plus, it gives full access to the disc features (menus, etc. ), you don’t lose any quality, and you can re-burn VIDEO_TS to a DVD and have a watchable disc just like the original. Front-End Hardware - Dell Studio Hybrid PC. I picked up a Dell Studio Hybrid PC to be the hardware sitting in my living room. It has a great form factor and all the right connections (DVI, HDMI, S/PDIF audio) to make it a perfect media center PC. I had considered getting a Mac Mini, as several other folks have done, and run Boot Camp to boot into Vista, but the Studio Hybrid was far cheaper and more powerful than the top-end Mac Mini. I set up the “DVD Library” in Windows Media Center rather than using the popular My Movies plugin because, again, I really wanted as few “moving pieces” as possible and My Movies didn’t seem to offer me anything I truly needed. If, at some later time, I want to start using it, I haven’t engineered myself out of it - I can install it and import the movies that already exist with a minimal amount of work. I rip my DVD movies onto the Synology DS1010+. The Dell Studio Hybrid PC, which is connected to the TV in my living room, reads the list of movies from the NAS over the network and displays them beautifully on the TV for me to select from. I was running this nicely over wireless, but started running into interference issues, so it’s now a wired network. My photos are accessible through not only the Windows Media Center, but also through my Xbox 360 and PS3 via the DLNA sharing that comes for free out-of-the-box with my Windows Home Server. My music is accessible to DLNA compliant devices (Xbox 360, PS3) through Asset UPnP on the Windows Home Server. Windows Media Center doesn’t natively play Apple Lossless (though with Windows 7 it does play AAC) so I don’t have it running through the Media Center. 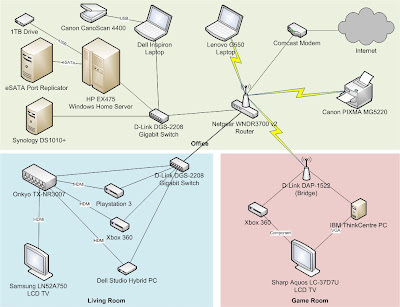 Here’s a picture of the current network topology, with a little added detail around how things connect to my TV. It’s pretty simple, not a lot of moving pieces, and the majority of things are wireless. As much as possible is also connected directly to the network (like my printer) so I can access anything from anywhere. Everything in Home Theater PC-land is tribal knowledge. It took the majority of my time to figure all of this out because there are far too many options with far too few people providing information in accessible locations. Most information on this stuff lives in forums, making it hard to pick through and figure out what’s going on. When you ask questions, people assume you already know a bunch of stuff you don’t know, so you get very cryptic answers, which you then have to go research and ask more questions about. Even in a simple environment, things are fiddly. Getting everything stored centrally, updated properly, displaying right, with correct access… it’s trivial, annoying, fiddly stuff. Tweak this registry setting, add a symbolic link to this folder, map this drive, configure this setting… it’s a pain, and if you don’t get it right, things don’t work as smoothly as you’d like. So, now that it’s done - two years in the making - what am I going to do next? After some research and pricing, I ended up getting a Dell Studio Hybrid PC from Best Buy. Dollar for dollar, I got more horsepower than if I had gone with a Mac Mini, and I didn’t have to get a separate Windows Vista license. It came with Vista Home Premium (which includes Media Center), a dual core 2.1GHz processor, 3GB RAM, wireless-N built-in, DVI and HDMI output… basically, it was set to go as a Media Center, and it was $50 less than the better of the two currently offered Mac Mini models. Installation was a snap. There were (obviously) a few fiddly things to deal with like setting up the media center user account, connecting it to my Windows Home Server for backup, setting up Windows Media Center to find all of my media… but really no major hiccups. The Windows Media Center setup wizards are fantastic and really get you going in great shape quickly. There are only a couple of things I need to deal with, neither of which are showstoppers so much as generally annoying. Monitor resolution. When you’ve got a home theater PC, your TV is effectively your monitor. Unfortunately, my TV only supports a certain number of resolutions, only a few of which are also supported by the out-of-the-box video card and drivers that came with the PC. To that end, I have things displaying at 1280 x 768, which is nice and crisp (and supported on my TV) but leaves a bit of a black letterbox on the right and left sides of the screen since the full resolution of the TV is 1366 x 768. I may look into an application like PowerStrip to see if I can tweak the card into displaying a full resolution, but then, the half-inch letterbox on either side of the screen really isn’t killing us, either. UPDATE: Several forums report PowerStrip doesn’t work with Intel integrated graphics cards, which the Hybrid has. There is a tool called DTDCalc that is supposed to do some craziness to get things to work, but it looks pretty hacky to me (or at least it doesn’t abstract me away from the hackiness much) and involves knowing about VESA standard timings and such. Yow. Anyway, for those bold enough to take that leap, there it is. UPDATE 2: I tested out connecting the Hybrid to the TV using an HDMI cable rather than the DVI cable I was using. When doing that, I had several new resolution options to choose from including 1920x1080i. My TV didn’t really “like” that resolution and didn’t display it properly (things stretched off the screen and flickered really bad) but the experiment proved out - the information coming in from the TV is what tells the PC the resolutions it supports. It’s an older TV and I’m planning on getting an upgrade soon, so hopefully the new TV will better support the signal. UPDATE 3: I got a Samsung LN52A750, hooked the PC up via HDMI, and instantly got full 1080p high-def output. No tweak required. No letterboxing along the sides. Everything looks brilliant. Whew! Remote control IR frequency conflict. The Media Center remote control and IR receiver that I bought, which is a nice yet inexpensive unit, happens to use the exact same infrared frequency as the Xbox 360 so when you turn on/off the PC with the control, it also turns on/off the Xbox 360. Since I rarely use the Xbox 360 remote (only when watching HD DVDs) I’ll probably find some sort of temporary cover for the IR receiver port on the 360 so I can cover/uncover it as needed. Windows Home Server backup and machine sleep. When you “turn the PC off” with the remote, you’re really putting it to sleep. When Windows Home Server connects to the PC to back it up, it wakes the PC up. Unfortunately, it isn’t going back to sleep after that. I need to work on the power settings so it goes back to sleep when it’s done backing up. UPDATE 2: I had some issues getting the HDMI signal to come back if I put the PC to sleep while the TV was off. It looks like getting a little HDMI switchbox fixes that. I’ll put together a network diagram soon so folks can see how the whole system came together. I’ve been looking at solutions to my media center problem for almost two years to the date, so it’s nice to finally have it solved. I took the plunge today and decided to do a little upgrading on my Windows Home Server. I was already going to have to add some drives, and found so many people out there who noted that a RAM upgrade was a massive improvement, I decided to do both - add RAM and drives. I also adjusted my pagefile size (there’s a guide for that, too). The difference? I don’t have many add-ins running (just the standard stuff that came on the server and the KeepVault backup add-in), but even the basic Home Server Console comes up noticeably faster. Before the upgrade, the console took maybe 10 - 15 seconds to come up. Now it takes maybe three seconds. Definitely an upgrade that was well worth doing. I also bought two 1TB Western Digital Caviar GreenPower drives to put in. Admittedly, the “green” aspect of the drives is nice, but the simple fact is that they were on sale for $155 each at Fry’s (limit one per customer, so I had Jenn buy one) and I didn’t have to take my chances with NewEgg’s shoddy OEM drive packaging… plus, since it’s a retail package, I get the full retail warranty. Adding a drive to the Home Server is the easiest thing in the world. Power down the server, take one of the empty drive trays out, snap the drive into the tray, put the tray back in its slot and snap the drive in. Done. Power up the server and it sees the drive - all you have to do is, through the Home Server console, tell it if you want it to be added to the main server storage or not. I added both drives to the main body of server storage since I’m ripping DVDs to it and ended up with a total capacity of 2.73TB (1.91TB free). The difference in space is due to that awesome “marketing 1KB == 1000 bytes, computer 1KB == 1024 bytes” thing. You only get about 931MB of actual usable space on a 1TB drive. Regardless, after these upgrades, my Windows Home Server is a tiny box of awesome. Now I’m going to go set up that Dell Studio Hybrid I ordered for our home theater PC. UPDATE 2/4/09: I’ve added an eSATA port multiplier and two more 1TB drives for a total of 4.55TB in storage. It was an easy upgrade that enables future storage upgrades without using the USB ports up.